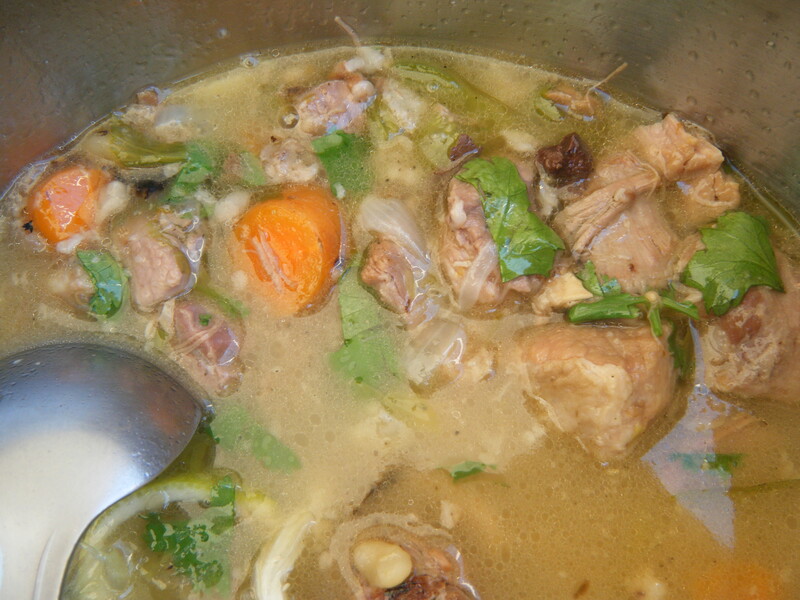 Posole is a very traditional recipe that was prepared in the region now consisting of Central America. The common ingredient of the soup for thousands of years has been corn that is prepared as hominy. This palate pleaser at our Animal Processing Workshops uses a rich slow cooked soup stock that is beneficial for our joints and bones. Serve with lime and cilantro. Buen Provecho! A pot of steaming hot posole, garnish with cilantro and lime and you have a mouth watering meal. Photo courtesy of Brian Harris. Roast the Anaheim peppers on the coals (or in a frying pan if cooking at home) until the skin is slightly brown. Place in a plastic bag to “sweat” the peppers for about five minutes. Peal the skin from the peppers, open and de-seed the peppers and dice. Place the stock into the pot and place the pot on the fire to begin heating. Wash and cut the meat into one-inch cubes and add to the stock. Bring the stock and meat to a boil then reduce the heat until the stock just simmers. Cook until the sinew in the meat is soft and the meat is tender, 1 to 2 hours. When the meat is sufficiently tender, add the vegetables and spices to the soup and simmer until the vegetables begin to soften, approximately 20 minutes. Add the meat that was removed in the process of making the stock and the hominy to the soup. Bring the soup to a boil and then reduce the heat to a simmer. Simmer for ten minutes. Learn more about our Animal Processing Workshops.